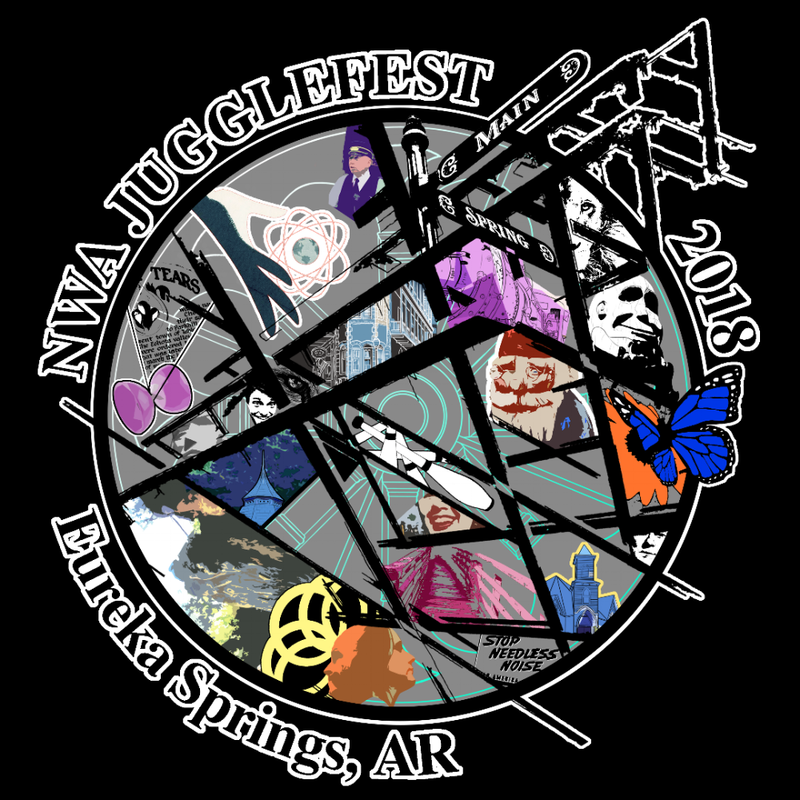 The Northwest Arkansas Juggling Festival brings local communities together with jugglers from all over the country for a fun-filled weekend of juggling-related madness. Enjoy creative play through games, workshops, social circus, demonstrations, and shows. All skill levels and prop types are welcome. The general public is invited to come watch the activities in the gym and to learn how to juggle for free. All of the festivities will take place in and around historic Eureka Springs, AR (www.eurekasprings.org/) in conjunction with the Eureka Springs May Festival of the Arts. Don't worry though, there will still be lots of late night juggling fun in the woods. The festival camping area and afterparty are located at Green Tree Lodge (560 W. Van Buren Eureka Springs, AR). The park has a large in-ground heated pool, bathroom/showers, outdoor clubhouse, wood fired pizza oven, camp store and a guest laundry. It is only 1.5 miles from the main festival site and has a trolly stop right at the campground. Ticket prices will go up $10 at midnight on April 21st. Our camping reservation is limited to 25 tent sites and 5 RV sites so buy early to make sure you get one. A Huge THANK YOU! to the Eureka Springs City Advertising and Promotions Commission, the Eureka Springs Arts Council, Karma Kups, Brews, Chelsea’s Corner Cafe, Andy Green, All Seasons Properties, Nibbles Eatery, Granny's Place, and ESP Tours for helping to fund this event and make it free to the residents of Eureka.